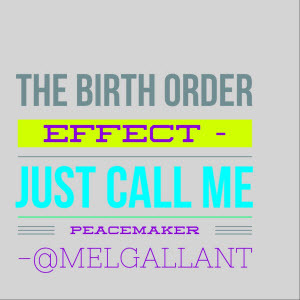 A friend shared an article about birth order on Facebook yesterday (thanks Julie!). And although there are a lot of generalizations made about the personalities of the oldest, middle, youngest and even solo child some of what the author says about birth order rings true for me. The author, Dr. Gail Gross, describes the middle child as a peacemaker. I so totally get that. Growing up I was the peacemaker in my family. Between my brother and sister. Between my siblings and my parents. Between my siblings and myself! I won’t say I was always successful at it though. But…flash forward to today and I can tell you I’m the only one in my family to speak to all members of my family on a regular basis. Does that make me a peacemaker or just someone who truly wants to keep the bonds (however loosely tied) of family together? If you are a middle child, you are probably understanding, cooperative and flexible, yet competitive. You are concerned with fairness. In fact, as a middle child, you are likely to pick an intimate circle of friends to represent your extended family. It is here that you will find the attention likely lacking in your family of origin. As a middle child, you receive the least amount of attention from family and as a result, this family of your choice is your compensation… Though often a late bloomer, you find yourself in power careers that allows you to use your negotiating skills… and get that all too-needed attention. Not sure I would say I’m in a “power career” but I definitely was a late bloomer and I do see my intimate circle of friends as my extended family. For most of my adulthood my parents and siblings lived on the other side of the country. Plane tickets across Canada are expensive and barely doable on a student income. So I only saw my family ever two to three years. My friends became my surrogate family — hosting me for holidays, supporting me through tough (emotional and financial) times. Good friends are good like that. That said, I see a little bit of myself in each birth order description. Case in point: That ‘planning a trip’ example Dr. Gross provides at the top of the article? I’m a combination of scenarios 1 and 2 for sure. My daughter is an only child. And it’s interesting what Dr. Gross says about the solo child being a blend of the oldest and the youngest child. I do find my girl to be resourceful, creative and independent. But honestly, who wouldn’t say that about their child(ren)? I worry sometimes about my girl not having siblings. We try to arrange as many play dates as possible. And she has a tight circle of friends at her daycare. So I’m not worried about her feeling lonely or not learning how to share, etc. It’s more when she’s older…and has to take care of her aging parents; shouldering that burden herself. I know, I know. In the end, she will be fine. There are tons of only children out there doing just fine. It’s every once in a while I get a big maudlin about it is all. Birth order alone doesn’t dictate personality… but it does have an impact. Even if you think it’s all a bunch of hoo-ha, these personality descriptions are interesting to think about. Do you believe birth order impacts personality? Which child are you — the oldest, the middle, the youngest or the solo one? I’m the youngest of two or five, depending if you’re looking at my mother or my father, but the description doesn’t feel right to me. And we have our only, of course, watching her grow and change, interested to see what happens. Mel – great post! I definitely see you as the peacemaker. My middle child is too and this whole concept interests me. Although I’m a middle child technically, I don’t think 3 minutes separation between the first and counts and I wouldn’t call myself the peacemaker of the 3 that’s for sure. I think among my siblings birth order got trumped by astrology :-).